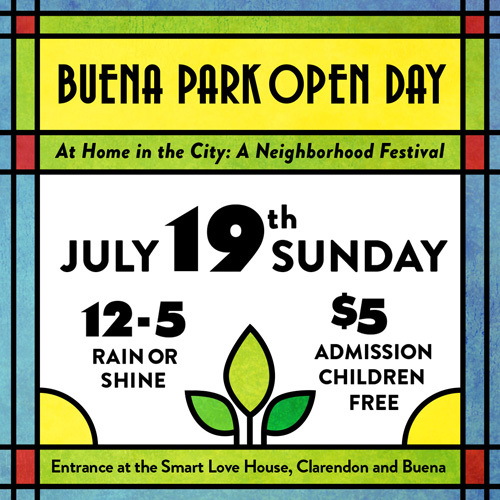 For this year Buena Park Open Day celebrates its third-annual neighborhood festival July 19, from noon to 5 pm. With an “At Home in the City” theme, the festival highlights why our neighborhood motto is “Good Living by the Lake.” Grab friends and family and come join us for a great day in the hood. The festival’s hub will be at the Smart Love House at Clarendon and Buena. Sign up for architectural tours, participate in family friendly activities, shop the new Bazaar on Buena, listen to live music or take a break at the pop-up café. Bazaar on Buena: features Etsy quality arts and crafts plus a neighborhood rummage sale. There will be sidewalk tours of the architect George Maher’s historic homes on Hutchimson Street. Come out and tour with one of our highly trained volunteer docents. Tours are on the half-hour between 12:30 p.m. and 4:00 p.m.
Also featured are an open house and tours of St. Mary of the Lake Church, 4200 N. Sheridan Rd. This nearly 100-year-old church, designed by Chicagoan Henry J. Schlacks in the Italian Renaissance style, features Carrera marble work from the same quarries used by Michelangelo. Tours are at 2:30pm, 3:30pm, and 4:30pm. A Pop-up Café that’s is fueled by a bevy of fabulous food trucks, including Cupcakes for Courage, Husky Hogs and Meatloaf-a-Go-Go located at Clarendon and Hutchinson Streets. Family fun runs all day long: exotic animals, bouncy house, games, sing-alongs, face painting, police horses, a visit from a fire engine, story time with the Alderman, hula hoop fiesta and more. Music all day will be by the Wolf Street Bloodhounds, a popular local bluegrass/rock band. Join the exhibits and activities that showcase neighborhood organizations and businesses, including the always popular Gingko Gardens, an organic community garden with a mission to provide fresh produce to Uptown organizations that serve low-income and homeless people. Many thanks to our generous sponsors who make BPOD possible: Thorek Hospital, SSA #34, reside living and the Chicago Cubs.